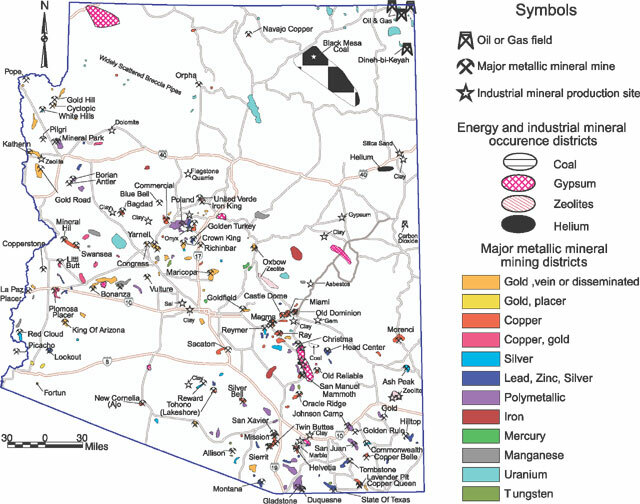 Arizona fell to second place in value of non-fuel minerals produced in 2015. The USGS Mineral Commodities Summary for 2015 shows Arizona producing $6.8 billion of mineral vs $6.94 billion in Nevada. 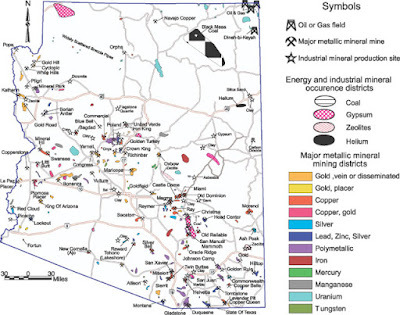 Nevada production is dominated by gold whereas Arizona is controlled by copper. Arizona production value was down 14% from the prior year. In 2014, Arizona mineral production was valued at $8.06 billion, or 10.38% of the national production, while Nevada as at $7.49 billion. Sen. Gail Griffin has reintroduced her bill, SB1440, to transfer the former Arizona Mining & Mineral Museum in Phoenix, rom the Arizona Historical Society to AZGS to be re-opened as the Arizona Mining, Mineral, and Natural Resources Education Museum. The bill is essentially the same as the version that passed last year in the Legislature, 25-0 in the Senate, and 58-2 in the House. Governor Ducey vetoed that bill. The museum was transferred from the Dept. of Mines & Minerals Resources (DMMR) to the Historical Society in 2010 in anticipation of converting it to the Arizona Experience museum for the 2012 Arizona Centennial, but funds were not raised. The museum shut down in 2011 and has been vacant and closed since then. DMMR was merged into AZGS in 2011. Fans and advocates of the old museum have campaigned relentlessly to have it reopened. The new museum would have a dramatically expanded mission, adding agriculture, livestock, forestry, and education to its portfolio. SB1440 would transfer an unstated amount of funds for the rent, plus one curator position. Additional funds would come from the fees paid for centennial license plates. The bill faces an additional complication this time, since Gov. Ducey is proposing that AZGS's duties be transferred to the University of Arizona. "For FY2017, the Executive recommends consolidating the Arizona Geological Survey with the Department of Geosciences within UA’s School of Earth and Environmental Sciences. The State Geologist would continue to be a gubernatorial appointee." 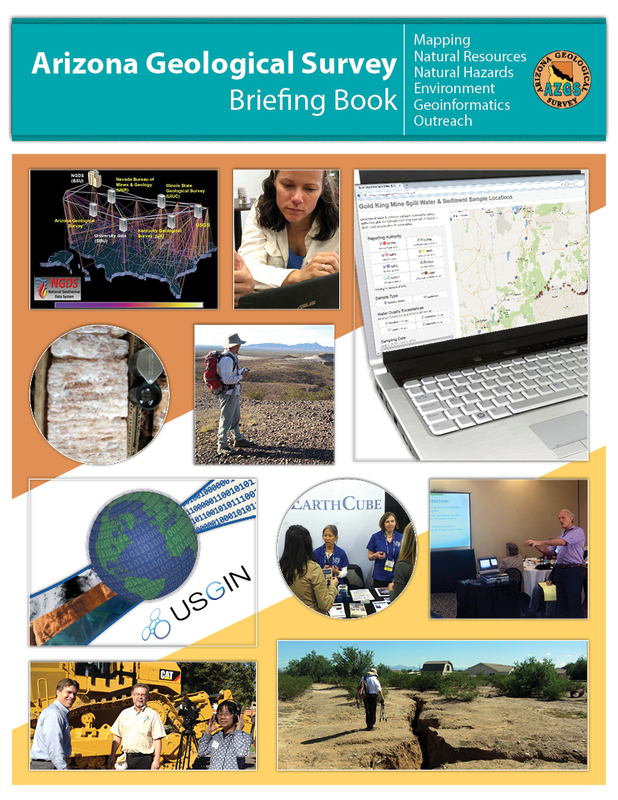 Since 2011, the Arizona Geological Survey has successfully raised more than $35,800,000 in external research grants from federal, state, local, non-profit, and private sources. Over that same period our total cumulative state appropriation was $5,364,100, for a Return on Investment of $6.68 of income for every $1 of state funds. This compares favorably with top tier research centers across the country. In addition, we have numerous funding proposals under review and have been told to expect new awards of at least $1.6 million this fiscal year. That would increase our ROI number. We compiled these numbers for inclusion in briefing materials we are preparing for the University of Arizona to help them understand and evaluate Governor Ducey's proposal to transfer the duties of the AZGS to the university. These grant funds have been key to maintaining and even expanding state services despite significant state budget cuts during the Great Recession. 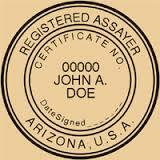 A bill in the Arizona Senate would eliminate the requirement for assayers to be licensed in Arizona. SB1256, filed by Sen. John Kavanaugh (R-Fountain Hills) would drop Assayers from the list of professions regulated by the Arizona Board of Technical Registration. The Board previously voted to make this change. Arizona appears to be the only state in the country to license assayers, initiated as a way to minimize mining fraud from unqualified, phony, or doctored assays. The group of licensed assayers is opposed to eliminating licensing and is seeking to find another state agency to take over this duty. Copper is the current State Metal, hence Arizona's moniker as the "Copper State." Turquoise is the State Gemstone, adopted in 1974. Petrified wood, or araucarioxylon arizonicum, is the official state fossil. Governor Ducey's Fiscal Year 2017 budget proposes transfer of the Arizona Geological Survey duties and responsibities to the University of Arizona, beginning July 1, 2016. The Arizona Geological Survey was originally housed at the University of Arizona. While the Survey was formally established as an independent State agency in 1988, it retains strong collegial and logistical ties with University faculty and staff. Both engage in rigorous academic geoscience research that greatly benefits the state. For FY 2017, the Executive recommends consolidating the Arizona Geological Survey with in the University of Arizona. This model, adopted by 20 states, is designed to enhance synergies by streamlining services and location of geological mapping data to better serve stakeholders. It presents potential for greater opportunities to successfully leverage research grant funding, can provide a direct pipeline of student researchers to the survey, and should help attract high-profile geologists. The Executive recommends moving the Oil and Gas Conservation Commission to the Department of Environmental Quality. If the Legislature approves the proposal, the details of the shift of duties will be worked out between the Governor's Office and the University. A bill submitted to the Arizona House today would prohibit hydraulic fracturing ("fracking") for oil and gas production. House Bill 2407 amends statutes of the Arizona Dept. of Environmental Quality to state that "A person may not engage in hydraulic fracturing in this state and may not collect, store or treat water in this state if that water is used in, generated by or resulting from the process of hydraulic fracturing." Hydraulic fracturing is being blamed for earthquakes in Oklahoma, Kansas and other areas, when in fact the quakes are likely being caused by the deep underground injection of wastewater from oil and gas production in those regions, a practice common in the industry worldwide for decades. 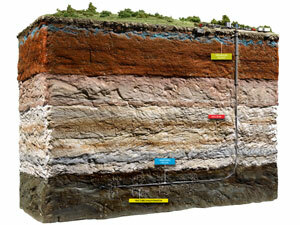 However, the use of hydraulic fracturing has resulted in increased water production. A few exploration wells have been hydraulically fractured in Arizona in past decades but none in recent years, and none of the 16 or so producing wells in Arizona were fracked. There are no proposals to do so anywhere in the state. A permit to 'frack' requires approval from the Oil & Gas Conservation Commission and the Arizona Dept. of Environmental Quality. Governor Doug Ducey, in his State of the State address today, called for filling four positions in the Arizona Department of Water Resources, with one hydrologist and three planners. ADWR staffing has decreased from 250 before the Great Recession to 125 today. "If there’s one thing Arizona is best in the nation at – it’s water. We sit in the Capitol city in one of the largest metropolitan areas in the nation in the middle of a desert. Thanks to revolutionary planning efforts like our 1980 Groundwater Management Act, and leaders from Carl Hayden to Mo Udall to Jon Kyl, Arizona has grown and thrived. I’ve also given the green light to the Arizona Department of Water Resources to use existing dollars to hire new staff that the water community has been requesting for years – experts who can take these plans and make them work." The infographic below provides a snapshot of selected outreach activities and products. The full report offers a more detailed recap of accomplishments, services, and products available to our stakeholders and customers.